A beginner’s guide to creepy houses, amazing detail, stunning cinematography, gore-ous CGI ghosts, and a haunting if cliched story. Hi everyone! Welcome back! And thanks for helping me hit 1000+ views!!! Let’s get on with the review, shall we? Edith Cushing (played by Mia Wasikowska), a naive young writer who can see ghosts, falls deeply in love with the dashing but mysterious Thomas Sharpe, an impoverished baronet, marries him and goes with him to live in Allerdale Hall, also known as Crimson Peak. One thing you can’t fault Guillermo del Toro, the director of this film, is his attention to detail and amazing cinematography. 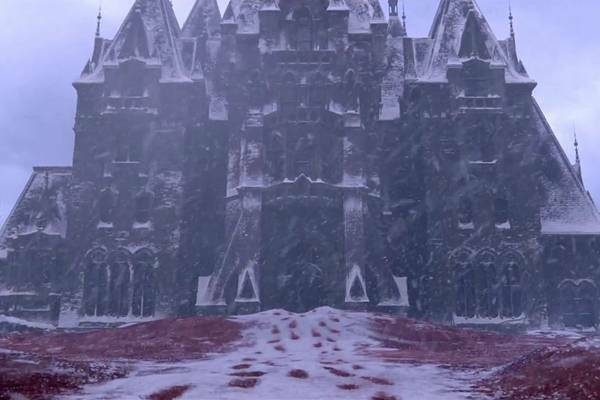 The titular location, Crimson Peak, is a compelling and haunting land in England, also called Allerdale Hall. I mean, just look at this. It’s stunning, isn’t it? It’s even more beautiful on screen. The movie definitely has that working for it, but that’s not all a movie needs (see: SuckerPunch). There needs to be a coherent and interesting plot. Many critics say that the storyline is cliched, and the tension built throughout the film is wasted, which I can agree somewhat. I was a little disappointed when it was revealed, because the tension made my mental story spinning (basically trying to figure out what was going on) go a little crazy. In fact, I feel that some of the plot lines that I came up with was more disturbing than the actual storyline. I have to admit, I am not a fan of horror shows, and this definitely is one, on a very low scale – I’m also an easy scarer (jump scares being one). This is probably the first show I genuinely chose to watch and freaked me out. I’m definitely never going to watch The Shining – although I have read the movie synopsis and plot. Not reading the book either. And, of course, I have to compare this with Pacific Rim, and Pan’s Labyrinth. I can’t compare Pacific Rim with Crimson Peak, because other than the attention to detail, the two movies are completely different. Pan’s Labyrinth is a Guillermo masterpiece. For some, it’s hard to believe that the person who created the Pale Man in the his lair created Crimson Peak, but I feel that these are two different movies by the same man. Pan’s was created and situated in a time and place where there is little to hope and dream of, and is a story both of a girl trying to find happiness and place to belong, as well as show another universe that could exist just off a corner. 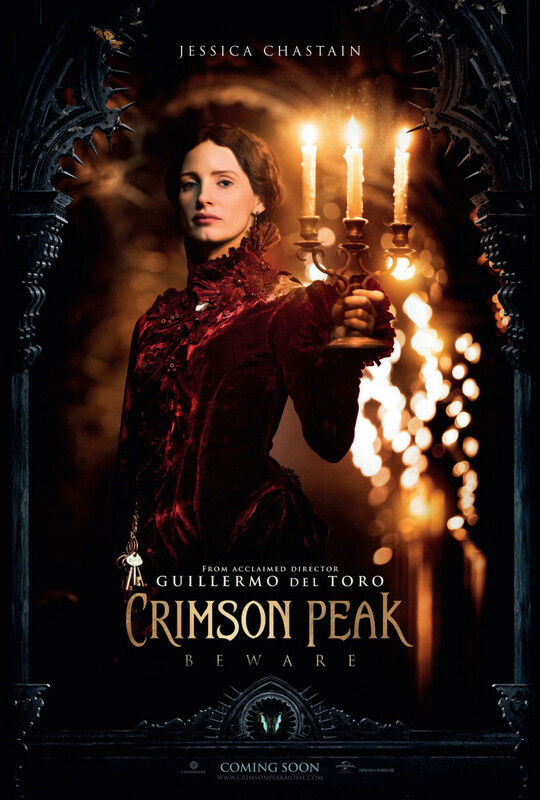 Crimson Peak is Guillermo’s first intro into gothic romance horror. Gothic romances don’t exactly have the best reputation amongst audiences as a good storyline. There are good stories, but they usually involved fairly cliched plots compared to what we have in the media now – Scandal, Awake, How to Get Away with Murder, The Blacklist, Elementary, Silver Linings Playbook, etc. For people who are just starting to watch movies, or moviegoers looking for a taste of decadent gothic romance, this is a movie to watch. I don’t recommend buying this however, as this sort of visual delight should be caught on the silver screen.